The 4th Annual 5K Night Run for Life & 1 Mile Stroller Stroll/Fun Trot starts and finishes at Town Park in beautiful downtown Taylorsville, NC. 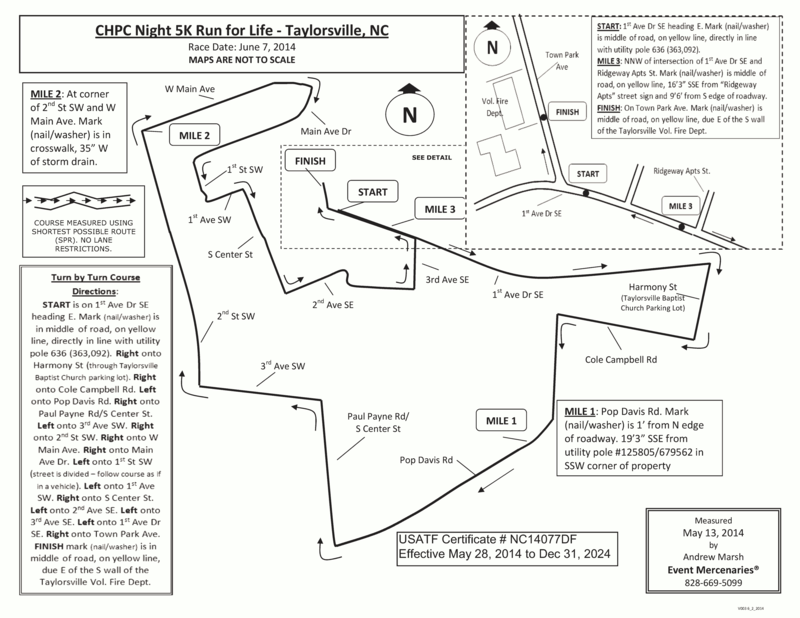 The well lit, USATF certified course [NC14077DF] offers a challenging run (or walk) through local neighborhoods. The family fun festivities kick off at 5:00pm with plenty of food, live music, and Kid’s Zone including slides, obstacle course, bounce house, face painting and much more. On-site registration and packet pick up is open until 7:00pm. The 1 Mile Fun Trot 7 Stroller Stroll begins at 8:00pm with the 5K Run/Walk starting at 9:00pm. Event details are available at www.caringheartspc.com/run-for-life or on Facebook at 5KNightRun. Run, walk, or hang out under the stars for a great cause.